The original Cape Verde flag was similar to the flag of Guinea-Bissau. It had two horizontal stripes: green on the bottom and yellow on the top. There was a vertical red stripe on the left hand side. In the center of the red stripe was an emblem with a black star and a green and yellow U-shaped wreath. 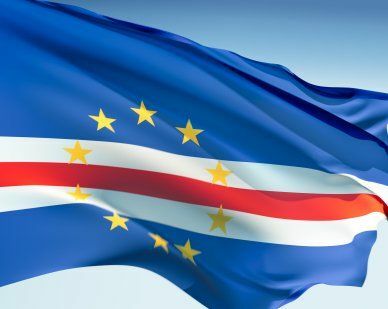 Since 1992, when Cape Verde became independent, the nation adopted a new flag featuring a blue background with a horizontal white stripe. In the center of the white stripe is a thinner stripe of red. A ring of 10 yellow stars is on the left center. This is the flag that is used today. Our top-quality Cape Verde flags conform to all official specifications. Emblems and designs are executed with the highest possible degree of accuracy in regard to detail, color shades, placement and proportion to flag size.